How To Get The Most From Café Cubano! Experience Cuban Coffee! For a memorable taste of Latin-America, consider treating yourself to a Café Cubano! 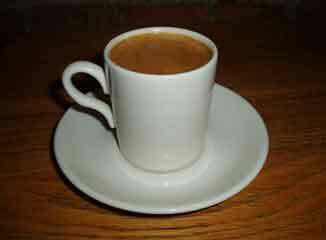 Cuban style coffee can be likened to doing a ceremonial shot at the local bar, only in this case, it’s a coffee bar. Cuban-coffee, also called Café Cubano, Cafecito, or simply Cuban Espresso, is a powerful espresso-like drink that originated in Cuba after Italian Espresso machines were first imported. A thimble size shot of this concoction is a morning ritual for many Cubans and Cuban-Americans, but much akin to espresso, a well-made cafecito has sweet crema floating atop a strong cup of coffee. Despite its name, crema has nothing to do with cream—Crema is a flavorful, aromatic, tannish-brown froth that sits on top of a freshly brewed shot of espresso. It is formed when air bubbles combine under pressure, with the volatile oils found in fine-ground coffee. Some refer to this as the "Guinness effect" due to the similarities of the "head" on a draft of the popular Irish stout. Many don't realize that it's the technique for making the crema—not the type of coffee beans used—that makes the coffee Cuban, however -make no mistake, a high quality fresh roasted coffee makes this a much finer experience. This style of coffee was originally brewed in a regular pan or pot on the stove but now, at least in America, the Stove-top Espresso maker or Moka Pot seems to be the brewer of choice for Café Cubano. It is generally prepared using a very dark roast coffee of your choice, however you may use any coffee you like with pleasing results, providing it’s fresh and properly ground. (espresso grind is best) As with all other brewing methods, the only thing of real importance is that you use a coffee and brewing method that suits your personal taste. Once again, high quality, fresh roasted coffee will certainly give you the most satisfying and memorable experience, no matter what coffee or brewing method you choose. The preparation is very similar to that of Stove-top Espresso but it’s usually sweetened during the brewing process like Turkish coffee. You won't get the same results by sweetening after the fact. Feel free to sip and savor this coffee to your hearts content, but if you wish to go the traditional way of Cuba, enthusiasts will tell you that this type of coffee is meant to be "shot" (Hold the lime!) and then savored! For an excellent step by step "Pic-tutorial" on brewing methods for Cuban Coffee and Café con Leche (Cuban Coffee with Milk), please click on the I Need Coffee icon below! Lakota's Italian Roast or our famous Espresso are ideal choices for Cuban Coffee! Lakota Coffee Company and Roasters! My name is Lee Eckel. 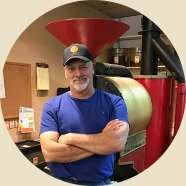 I'm a Specialty Coffee Roastmaster with many years of experience in the coffee industry. Please allow me to be your guide to discovering the World's Best Coffee...!